The Commitment is Low. The Value is High. There’s little doubt: many organizations are investigating Model Based Definition (MBD) and Model Based Enterprise (MBE) initiatives. 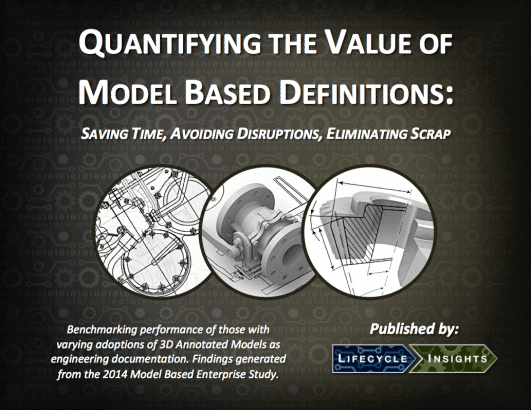 This eBook shares findings that quantify the value that organizations are gaining due to Model Based Definition (MBD) adoption. Specifically, it splits the 575 respondents of the Model Based Enterprise study into four different cohorts based on their varying reliance on 3D models and Product and Manufacturing Information (PMI) or 2D Drawings for engineering documentation. The cohort definitions are shared below. The eBook then proceeds to show variations in organizational performance across three different metrics, including total average time spent on engineering documentation per engineer, the frequency of reprioritizations of engineering personnel resources and the frequency of product errors due to engineering documentation. This eBook provides the most value for Engineering Managers and Directors who are trying to understand where the value of Model Based Definition (MBD) initiatives lie. It also delivers value for Technical Champions that are tasked by Engineering Executives to realize benefits from such initiatives. When it comes to the adoption of Model Based initiatives, the industry seems non-committal. Fully 58% of the respondents to the 2014 State of Model Based Enterprise study have produced 3D Annotated Models as engineering documentation. That means there are a lot of companies that are experimenting, either fulfilling contractual requirements or testing its value. However, few have fully committed to leveraging 3D Annotated Models as the main source of engineering documentation. Only 9% release 3D Annotated Models more than 2D Drawings. 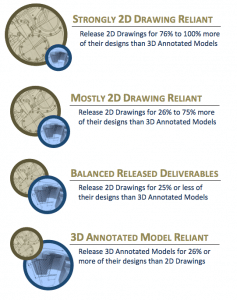 Furthermore, only 2% have gone completely with 3D Annotated Models as their only form of engineering documentation.